ERP means "Enterprise Resource Planning". A ERP System is a software system which is used for managing an Enterprise in multiple departments. Fig. 1 - What is ERP? 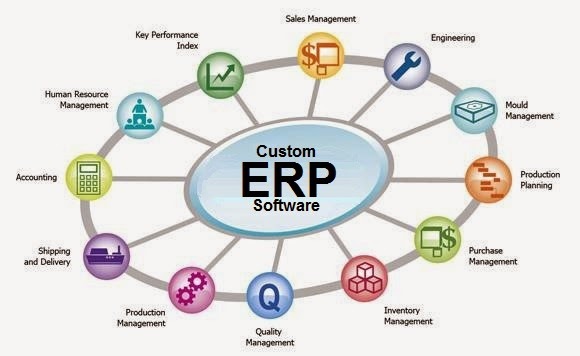 People sometimes also refer to ERP Systems as ERP Software, a ERP Solution or ERP Platforms. These all refer to business software applications used to manage a business and its resources. What are the features of a ERP System? Who maintains a ERP system? ERP systems are maintained most often by the vendors either by a local support technician or by a remote agent with regard to cloud based systems. Usually, a maintenance contract is made for server based systems to ensure there is a response in the event of a critical problem such as a security compromise. Support is the most important area of ERP use as without it, organisations are unable to make changes to their systems. It is critical that support can be carried out by third parties if required to ensure a competitive landscape in ERP maintenance as not to put the business in a vendor-locked situation. Some of these tasks will be the responsibility of the vendor and some of the organisation / company administrator depending the SLA (Service Level Agreement). An experienced ERP project manager can overcome all of these pitfalls if given the remit to do so. How to Select the Right ERP System and ERP Provider? How much it is cost? What features does your employee's need? Do you own it when you buy? How many users can use the system? What are the	limitations of the options? How fast is the Internet requirement? What is the server specification requirement? Can you export your data? Can you import your data? Do you have freedom to copy it to a second site? What type of security is in place? How can the system be customized? Can you modify the code? What experiences have others had with the same system? If you chose a reputable ERP consultant and vendor, they will assist you with your requirements gathering. Why choose erp2 for your ERP? As experts in ERP implementation, we 100% are confident that you will find our ERP consulting, design, installation and maintenance service of the highest standard. We can provide you assistance globally with our advanced remote technologies without sacrificing the freedom of your ERP system (you can own the server, OS, platform and system code).